Get S’more outa life – indoors! I just discovered a website devoted entirely to S’mores – you remember, those habit forming treats you made around the campfire as a Girl Scout? I’m making these this afternoon – sort of a ritualistic thing – since I’m giving up sugar again for Lent. This will be my last hurrah! The editor tells you all about various versions you can make without having to go outside and build a fire – though that’s always best. 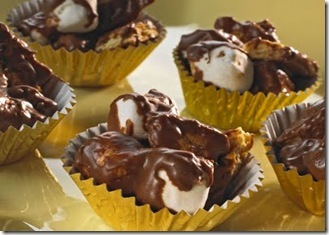 EASY S’MORE CLUSTERS (What could be easier?) I may never bake again. 1. Place chocolate pieces in medium microwave-safe bowl. Microwave at MEDIUM (50%) 1-1/2 to 2 minutes, or until chocolate is melted when mixture is stirred. 2. Stir in marshmallows and graham cracker pieces until well coated. Drop by spoonfuls into miniature paper muffin cups (1-3/4 inches in diameter). Cover; refrigerate until firm. About 2-1/2 dozen snacks. Campfire variation: Place all ingredients in tinfoil envelope and cook over coals or campfire (just like a tin foil dinner) for a few minutes. These are some of the cheapest s’mores that you can make. All you need are marshmallows and inexpensive, shortbread striped cookies (I get mine at Fred’s for about $1). The cookies provide the graham and chocolate in a cheaper, easier form. Just stack and Nuke ‘em for a quick treat. 1. Stack three squares of chocolate on one graham. Nuke for 10 seconds so the chocolate can soften a little. 2. Next place mellow on top of chocolate. Nuke for 20 more seconds, but watch closely as you do not want the mellow to roll off as it expands. 3. Once it reaches maximum size, before it rolls off, slap the top graham on, smooshing everything together for true fusion. Emily, we have a Reading Night at our school each fall – and S’mores have become a tradition. We use portable fire pits to roast the marshmallows. Of course kids always love burning stuff! They do taste great though. Thanks for the recipes (as always). I have just decided what will be our main dish for lunch today! Tom will be thrilled.